Lead-acid batteries (also known as LABs) are a common item in our daily lives. Once the lead of the battery is timed out, we have no option but to dump it because it has no use for us anymore, but the copper plates in the battery remain reusable which can be used for recycling. There are some disagreements about the benefits of recycling battery, say alkaline battery, over simple disposal because the mercury in the battery no longer exists and the disposal material is abundant and non-toxic. But for automotive batteries the scenario is different in terms of benefits. The recycling of this type of battery holds both economic and environmental benefits. The reusable material from the used battery is removed and recycled which reduces the needs for raw materials which is originally imported from abroad. It creates a balance payment and cost. In addition to this there can be considerable environmental impact during mining processes such as emission from smelting of sulfide ore, copper, nickel, and cobalt and this can be eliminated if recycling can be introduced. LABs generally consist of both sulphuric acid and large amount of lead which is not only corrosive but also a good carrier for soluble lead and lead particles. Lead is highly toxic metal which causes a wide range of adverse health effect especially on young children. If one gets expose excessively to lead it can cause damage to brain and kidney, impair hearing, and can led to various other associated problems. On an average an automobile manufactured contain about 12kg of lead, in which about 96% of lead is used in lead acid battery and remaining 4% is used in other applications like wheel balance weight, protective coating and variation dampers. Both lead and cadmium are harmful for human health and environment. This toxic substances seeps into the soil, groundwater and surface water through landfill and also releases toxins into the air when they are burnt in municipal waste incinerators. Moreover cadmium can be easily absorbed by the pant root and get into the fruits, vegetables, and waters are consumed by animals and human beings, they can fall to prey to a host of ill effects. Studies have shown that nausea, excessive salivation, abdominal pain, liver and kidney damage, skin irritation, headaches, asthma, nervousness, decreased IQ in children, and sometimes even cancer can result from exposure to such metals for a sufficient period of time. In a battery recycling plant, effective control measures need to be implemented, both to protect the health of workers and to prevent pollution of the environment. Good plant design, with reduction of the potential for the emission of contaminating substances is of utmost importance and the newer smelting processes are inherently much cleaner than traditional blast furnaces. Pollution abatement technologies, including the treatment of exhaust gases and liquid effluents, need to be installed. Those mostly exposed to releases within the plants are the workforce. Control measures such as maintaining minimum standards of air quality within the works, medical surveillance of employees, use of protective equipment, and provision of conditions of good hygiene in general, is necessary to avoid occupational lead exposure. However, few government/non-governmental steps have been taken yet; rather this practice is a traditional trading system as prevail in the society. In developing countries such as Bangladesh, recycling or reusing of used lead-acid batteries has both positive and negative impact on environment. Positive impact is that, if battery is recycled in proper and in sustainable manner it saves environment from toxic material of battery, otherwise battery waste is dumped into the landfills. Negative impact is that if recycling is not done in sustainable manner emits gases produced from battery recycling has adverse impacts on environment and human being. In a battery recycling plant, effective control measures are required to safeguard public health and environment. Direct recycling process should be banned as it has adverse impact on environment. As it is an illegal process, shopkeepers perform this process in hidden way. Government should impose the law and regulation strictly in this occurrence. This information can be used for advertising material highlighting the environmental benefits of recycling or reusing encourages the purchasing of old lead acid battery. It will accelerate the selling rate of old battery. Necessary steps should be taken to increase awareness about environmental impacts of used lead acid batteries. Proper instruction should be provided among the general mass. It will also increase reusing of old battery. Battery regeneration is a unique process specially designed to revive the lost capacity of batteries and give priority to choose secondary battery. Battery Reuse Centre can be developed for effective reuse and recycle. The aim to divert reusable battery, donated by the public, which often could have been destined for landfill and instead provides a much needed source of low-cost battery to those in need. The battery reuse service encourages volunteer involvement and trainee placements in all aspects of its operation. Awareness program (posters, pamphlets, TV & radio commercials, road-shows, website, exhibitions, talks), infrastructure, information center, tax rebates for manufacturers should be taken to increase recycling or reusing of old battery. Solid waste management is already a significant concern for municipal governments across South Asia. It constitutes one of their largest costs and the problem is growing year on year as urban populations swell. As with all waste management experiences, we have learned lessons and can see scope for improvement. There are two factors which have a significant impact on the costs and viability of a waste management system as it relates to collection and transportation: first, the distance travelled between collection and disposal point; and second, the extent to which ‘wet’ kitchen waste can be kept separate from dry waste much of which can be recycled. Separating waste in this way reduces the costs of manual sorting later on, and increases the prices for recyclable materials. In many larger towns distances become too great for door-to-door collectors to dispose waste directly at the dump site. Arrangements are made to dispose of waste at secondary storage points (large skips) provided by the municipality. However, where these are not regularly emptied, the waste is likely to be spread beyond the bins, creating a further environmental hazard. Ideally, and if suitable land can be found, a number of smaller waste disposal sites located around a town would eliminate this problem. With significant public awareness efforts on our part, and continual daily reminders to home-owners, we were able to raise the rate of household separation to about 60%, but once these reminders became less frequent, the rate dropped rapidly back to around 25%. The problem is compounded in larger cities by the unavailability of separated secondary storage bins, so everything is mixed up again at this point anyway, despite the best efforts of householders. If rates are to be sustained, it requires continual and on-going promotion in the long term. The cost of this has to be weighed against the financial benefit of cleaner separated waste and reduced sorting costs. 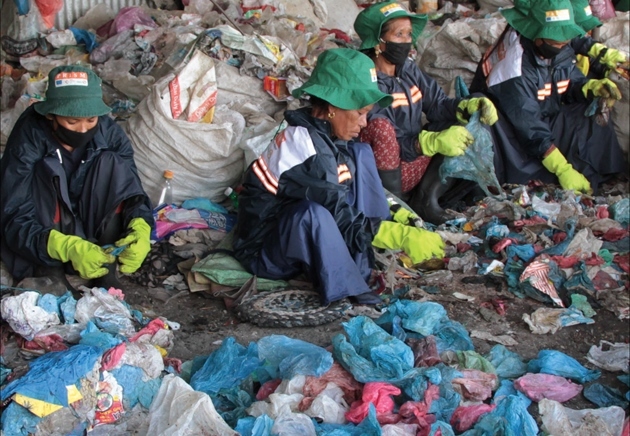 Our experience in Sri Lanka shows how important a role the Local Authority can play in continuing to promote good solid waste management practices at the household level. Our experience with home composting shows that complete coverage, with every household using the system, is very unlikely to be achieved. Where we have promoted it heavily and in co-operation with the Local Authority we have found the sustained use of about 65% of the bins. Even this level of coverage, however, can have an important impact on waste volumes needing to be collected and disposed of. At the same time it can provide important, organic inputs to home gardening, providing a more varied and nutritious diet for poor householders. The variety of technologies we have demonstrated have different advantages and disadvantages. For some, maintenance is more complicated and there can be issues of clogging. For the dry-fermentation chambers, there is a need for a regular supply of fresh waste that has not already decomposed. For other systems requiring water, quite large amounts may be needed. All of these technical challenges can be overcome with good operation and maintenance practices, but need to be factored in when choosing the appropriate technology for a given location. The major challenge for compost production has been to secure regular sales. The market for compost is seasonal, and this creates an irregular cash flow that needs to be factored in to the business model. In Bangladesh, a significant barrier has been the need for the product to be officially licensed. The requirements for product quality are exacting in order to ensure farmers are buying a product they can trust. However, the need for on-site testing facilities may be too prescriptive, creating a barrier for smaller-scale operations of this sort. Possibly a second tier of license could be created for compost from waste which would allow sales more easily but with lower levels of guarantees for farmers. Community people highly welcomed the concept of safe food using organic waste generated compost. In Sri Lanka, women been practicing vertical gardening which meeting the daily consumption needs became source of extra income for the family. 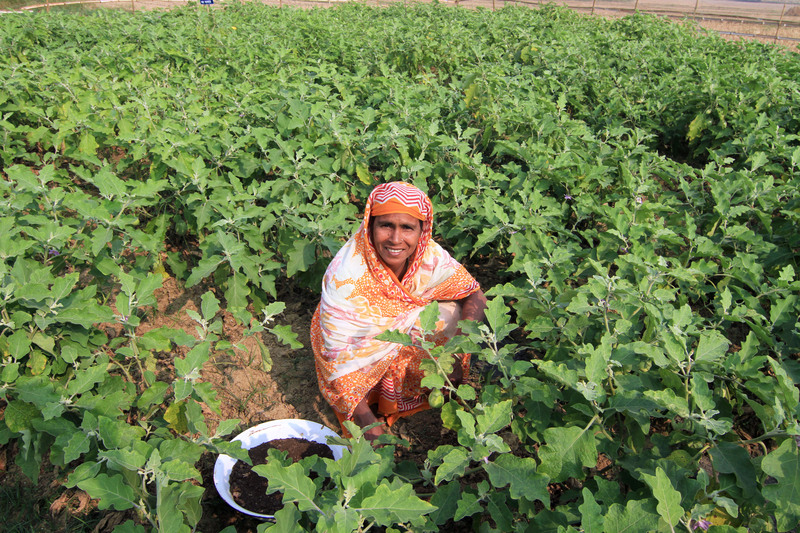 Female organic fertilizer entrepreneurs in Bangladesh are growing seasonal vegetables and fruits with compost and harvesting more quality products. They sell these products with higher price in local and regional markets as this is still a niche market in the country. The safe food producers require financial and regulatory support from the government and relevant agencies on certification and quality control to raise and sustain market demand. 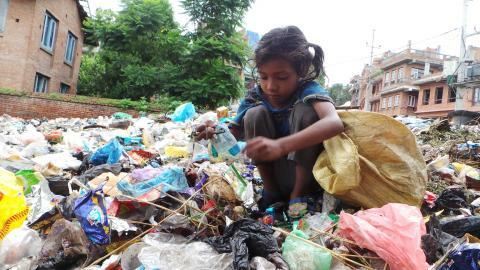 Solid waste management is an area that has not received the attention it deserves from policy-makers in South Asia nations. There are signs this may change, with its inclusion in the SDGs and in many INDCs which are the basis of the Paris Climate Agreement. If we are to meet the challenge, we will need new approaches to partnerships, and the adoption of different kinds of systems and technologies. This will require greater awareness and capacity building at the Local Authority level. If national climate or SDG targets are to be met, they will need to be localised through municipalities. Greater knowledge sharing at national and regional levels through municipal associations, regional bodies such as SAARC and regional local authority associations such as Citynet, will be an important part of this.